Show the world who’s the star with Coco Contact’s Wild Star lenses. 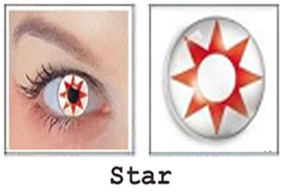 With a red star pattern in a contrasting white rim, nothing would keep people from staring at your obviously freaky eyes. Get your pair now only at cococontacts.com. These lenses are purely cosmetic and one of the contact lenses you can get without a prescription. fierce with Coco Contact’s Wildfire lenses. Give the look of contained range with its yellow orange glare. Yellow Spiked Sun with Black Background.